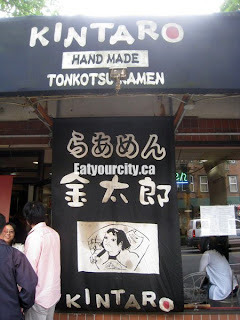 Eat Your City: Kintaro Ramen Vancouver, BC - still one of the best places to grab a bowl of ramen and their cold ramen bowl is killer in the summer!! Kintaro Ramen Vancouver, BC - still one of the best places to grab a bowl of ramen and their cold ramen bowl is killer in the summer!! 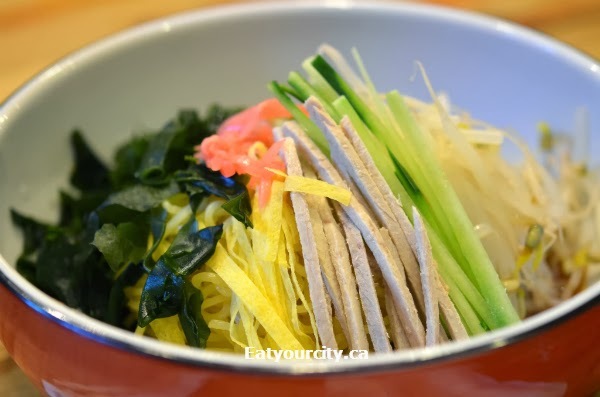 Posted by Last summer, during a visit to Vancouver, depite it being hot out, I was craving ramen. I know, you're supposed to slurp away at a steaming hot bowl of rich, savory broth and soft handmade noodles on a cold winter day. But I had a craving. We headed out late hoping to beat the heat and when we sauntered inside the un-airconditioner-ed.. we discovered we weren't the only folks who had a hankering for their excellent bowls of ramen who would brave the steamy heat coming off of the vats of soup stock simmering all day long. In the winter, its the perfect food to warm up to.. in the summer, I was going to try their cold ramen... I showed up in a swimsuit and beach wrap so I wouldn't have to sweat buckets inside... and many patrons took note to dress lighter next time when they saw me.. not sweating buckets lol! The line ups in the winter are still present in the summer and we're seated after a short wait. The seating is still very very cozy so expect to be meeting new folks that love ramen as much as you czu you'll be likely sharing a table with multiple groups. We watched the chefs assemble each ramen order with fresh ramen noodles, veggies, and bathed bowls full of rich golden broth... and other patrons wipe beads of sweat off their brow whiel they inhaled their steaming bowls of ramen. The chefs stayed cool by downing cups and cups of cold water as they cooked. Customers can choose from 3 types of broth: miso, shoyu or shio, as well as having light, medium or rich for the broth. To balance out the rich Tonkotsu broth, my boyfriend went with the lean char siu pork instead of the fatty option which is his go to ramen set up. Corn niblets and a soft boiled egg (he ate it before the pic), bamboo shoots, bean sprouts and green onions round out this ramen nom! I zero'ed in on the rich Tonkotsu broth, which had been simmering the pork bone stock so long, the broth looked like butter! I went big with the rich fatty melt in your mouth fatty char siu pork and cheese. I know its not traditional to have cheese in ramen, but it looks soooo good, I had to try. The char siu had a nice sweet smokiness to it and the cheese softly melting into the ramen and rich buttery soup was freaking delicious! It was almost a richness savory unami overload... nomnomnom! I was also ambitious, and ordered a cold ramen bowl (only available in the summer) to share. The ramen noodles were the same delightfully springy-tender as in the hot ramen bowls, but served cool and brightened up with a tangy ponzo based sauce, chewy kelp, thinly julienned scrambled egg, lean pork strips, cucumber strips, marinated cooked and cooled bean sprouts, and pickled ginger is a powerhouse of cool refreshing flavors I'd be happy to have as a meal every night (and not just in the summer when they make it for a limited time). Still one of the best places in Vancouver to go for a hot and cold bowl of satisfying ramen. Bundle up in the winter and strip down in the summer as this tiny little location always has line ups out the door!